Blencathra, also known as Saddleback, is one of the most northerly mountains in the Lake District. It is more like a small range than a single fell with a series of fell tops standing out on a 3 mile long curving ridge. The slopes to the north and west are smooth and easy whilst to the south and east are a system of rocky spurs and scree slopes. It has six separate fell tops, the highest point being Hallsfell Top at 868 metres directly above Hall’s Fell, marked by a sprawling cairn only feet from the edge. Blease Fell sits on the west and Scales Fell on the east. Between these two fells there is Gategill Fell, Hall’s Fell and Doddick Fell all of which fall as spurs from the ridge-top summit and are separated by four streams that flow down the south east face towards the River Glenderamackin and the River Greta. 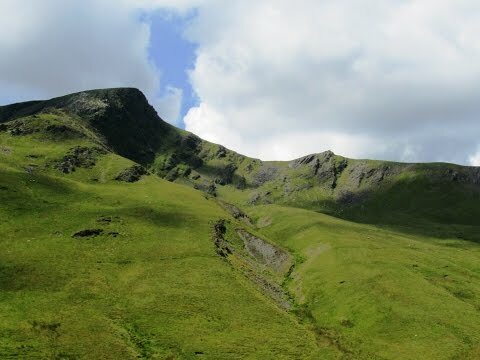 In addition to the spurs on the south east face, Hallsfell Top also throws out a high ridge to the north this is the saddle that gives Blencathra its alternative name and this rises to the sixth top Atkinson Pike. A good path connects the five summits on the main ridge giving superb views over the valley towards Keswick, Derwent Water and to the fells beyond. Between Tarn Crag and Foule Crag, below Atkinson Pike, is Sharp Edge which is appropriately named and is one of the most famous scrambles in the area. The crest of Sharpe Edge, formerly Razor Edge, is very narrow and a lot of effort and a good head for heights are needed to climb this edge. Below Sharp Edge is the pretty Scales Tarn, an almost circular lake filling a corrie. It is about 25 feet deep and plants and fish are scarce. The River Glenderamackin which drains much of the eastern and southern sides of Blencathra rises on Mungrisdale Common. The river flows south east through the valley below Blencathra and then north east below Souther Fell to Mungrisdale village. It then turns south to go under the A66 and from here it turns west then south west to just beyond Threlkeld where it merges with St. John’s Beck to form the River Greta. Scales is a tiny Hamlet consisting of only a few farms and buildings and a pub the White Horse Inn and Bunkhouse. Keswick is a market town in the Lake District in the county of Cumbria and lies within the Lake District National Park. Derwent Water is about 3 miles long by 1 mile wide and sits on the south edge of Keswick town and is fed and drained by the River Derwent. The river also connects Derwent Water to Bassenthwaite Lake which is north of Keswick. There are several islands in Derwent Water the largest being Derwent Island on which stands the inhabited 18th century Derwent Island House. The house is a tenanted National Trust property open to the public on five days each year. Lords Island was also home to a grand looking house and a drawbridge but in the late 18th century the house fell into disrepair and only the foundations remain now. The stone from the house was used to build Moot Hall in 1813. Moot Hall in the centre of Keswick was once the town hall but is now a tourist information centre and it is here in the square where the market is held every Saturday. During the 16th century Keswick was home to copper and lead mining on a small scale and the town was also the source of the world’s first graphite pencils. The pencil industry continued in the town until 2008 when it then moved to Workington. The Cumberland Pencil Museum and the Mining Museum are both close to the centre and are excellent places to visit on rainy days. Keswick is now mainly tourist orientated due to the many thousands of tourists visiting every year and the majority of side streets are abundant with B&B’s. From the lay by we head eastwards for a short way towards the pub and take the path at the end of the first building on the left. We head forwards and bear right to a gate. We go through the gate and turn right following the wall on our right. The wall becomes a fence and as the path turns sharp left uphill we keep heading forwards still following the fence. The path bears left downhill into the valley below and when we reach the track we turn left and follow the track quite steeply uphill bearing right to the top. At the top we keep heading forwards on the faint grassy path. After a short way we start bearing left downhill to cross the bridge over the stream. We keep heading forwards with the stream on our left following the track as it bears right on the side of the hill. We make our way to the head of the valley and walk steeply uphill to the top. We now turn left and keep heading uphill passing Sharp Edge on our left to the top of the first hill. We drop down for a short way then start heading uphill again to the top. At the top, Sharp Edge is straight forward, but we turn right at the cairn and follow the path on the level to Hallsfell Top. At the top we turn left taking the wide track downhill which after a short way zigzags still downhill. We now take the faint path to the left downhill to Scales Tarn. At the tarn we take the path on the right still going downhill following Scales Beck which joins the stream in the valley bottom. The path bears right and we return on the valley we came up on but on the opposite side following the path round the side of Scales Fell until the path slits then we take the right path uphill. The path bears right and we keep following it downhill back to Scales. Elevation: Approx lowest point 217.50m (713.6ft) approx highest point 864m (2834.50ft). Approx 6.8 miles allow at least 4 hours using OS Explorer Map OL5, The English Lakes North-eastern area. Start point: Road side close to Scales located on the A66. Scales situated on the A66 near Keswick. From Penrith cross over the M6 and head westwards for approx 10 miles and Scales is on the right. Parking: lay bys on both sides of the A66 before and after Scales. There are no public toilets. For refreshments there is the White Horse Inn & Bunkhouse at Scales. One and a half miles further on at Threlkeld there are two pubs the Horse & Farrier Inn and the Sally Inn (Salutation) both have B&B accommodation. The nearest public toilets are in Keswick where there is a variety of shops, cafes, hotels and pubs.